George and Amal Clooney stole the show at yesterday's royal wedding as Amal's bright yellow dress almost threatened to upstage the bride. But the morning after the night before gave a whole different look at the Hollywood couple, as they arrived in Sardinia via private jet for some much needed R n' R following Prince Harry and Meghan Markle's boozy evening reception. Touching down on the sun-soaked Italian island, Amal and George both wore dark sunglasses to shield themselves from the glare - no doubt feeling a little delicate after the late-night do. They arrived with their 11-month-old twins Ella and Alexander, plus an assortment of nannies and assistants to help them with their luggage. Human rights lawyer Amal looked a far cry from her glamorous wedding look - although still much more polished than anyone who has ever taken an easyJet flight four hours across Europe. She wore her long brunette hair down in a tousled style and stepped out onto the tarmac in a knee-length white summer dress, which threatened to blow up too high in the gusts of wind. George, meanwhile, dressed down in casual jeans and a tight t-shirt as he negotiated the jet's steps while holding on to Alexander. The Clooneys were among the 200 close friends and family members invited to join the new Duke and Duchess of Sussex at their private knees-up at Frogmore House, having jettisoned some 400 other guests after the wedding breakfast at St George's Hall. And the night sounded suitably wild for the man formerly known as the Party Prince, whose wild antics kept the tabloids happy for years throughout his twenties. There was dancing, drinking - and even a cameo appearance by Meghan's beloved rescue dog Guy, who caused mayhem as he ran around the dancefloor eating food that had fallen off guests' plates. Gentlemanly George even asked the bride to dance, taking her for a twirl while Harry watched on with hearts in his eyes. George then turned his attention to Kate Middleton, the Duchess of Cambridge, who indulged him with a dance. Earlier, the new royal couple declared their love for each other in short speeches. Harry told friends: "You are the people that make me 'me' in my Harry life, which as you know is the backbone to Prince Harry. "Now I'm going to hand over to my far better half…"
Breaking with tradition, Meghan also delivered an emotional speech to their guests, thanking the royal family for welcoming her and ending it by declaring: "I have found my prince." The couple chose Whitney Houston's hit I Wanna Dance With Somebody for their first jive. One of the 200 guests said of the ­reception: “It wasn't ­traditional in the slightest. They went into a bit of a jive and a lindy hop." Another added: "As we walked in there were ladies dressed in black, serving us fizz and Pimm's, as well as canapes from the palace staff. Yes, Carol - in fact I think it might be the other way round but only maybe based on hair - and obviously they're not popping to Sardinia for a break either. Thanks for the find Hairyhound. I agree they probably have the kids being carried backwards. Ooooh! They've obviously given up the fight against having the children papped. I wonder why? Just a thought , I think maybe they just wanted the first few month't with the babies for themselves.Also now they are toddlers it isn't as easy to cover them when they want to see everything. The twins both have Amal's facial features and not George's in my opinion. I don't think they will have his looks, they look more like her. Goodness me George lives large nowadays. Constant private jets and surrounded by bodyguards and assistants. He's living like Elvis. I think that's why his popularity has plummeted. Too big a gap between the left wing crap that comes out of his mouth and his ostentatious lifestyle. He fails to see the hypocrisy. Just thinking that since they're going to get media attention forever maybe it's better if they get used to it from the beginning. If the kids feel like they have to hide from the paps it will make going out in public much more stressful than if they just deal with it as a normal part of their lives. Goodness me, Kataryzna. Is that worse than the hypocrisy of someone who obviously doesn't respect Mr. Clooney constantly posting on a George Clooney fan website? The reporter who saw them clearly said the little boy looks like George and he should know. 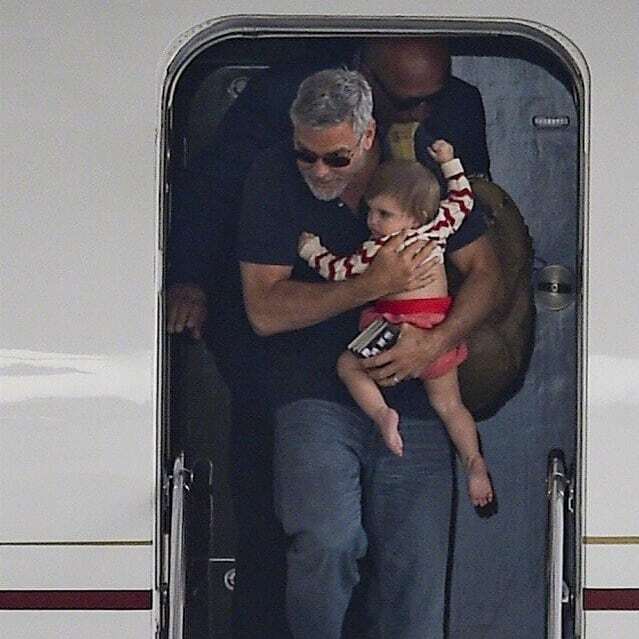 The baby in the carrier looked like Amal which is what George has said his daughter looks like her mama. Babies looks continue to change as they grow , In time you will be able too tell exactly who they look like . Babies' looks change from month to month so no one can say who exactly they look like. There's a theory that babies tend to look a lot like the father at birth (the science behind this is to reassure him that he really is the father) and then other family features come up. Katarzyna wrote: I think that's why his popularity has plummeted. Too big a gap between the left wing crap that comes out of his mouth and his ostentatious lifestyle. He fails to see the hypocrisy. George's popularity hasn't plummeted. He's been gradually becoming less and less popular as he got older and continued to make films he was interested in rather than appearing in the big Hollywood action films. He's been flying private for more than a decade. Living in mansions for close to two decades . . . this isn't new. premiere wrote: Those babies are beautiful. The one that I think is Alexander has very chubby cheeks. I love them ahahah. Sorry , but I have seen babies who were not beautiful, beauty is in the eye of the beholder. George has always described Alexander as the big thug and Ella as very dainty and sweet. I think George is carrying Ella over here, she looks smaller and more dainty than Alexander. Amal's carrying the bigger baby. So they probably got it wrong. I think the clothes give it away. The twin Amal is carrying is in jeans and a t-shirt. Very butch. The twin in George's arms (barely - why can't he ever put down his phone?!) is in pouffy pants and sweater. Not really a great look for a boy. - And the hair! 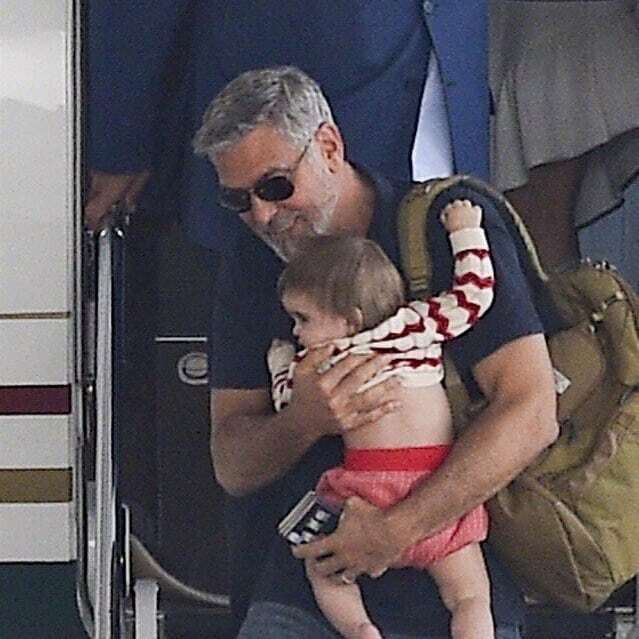 That side part on Amal's little guy is just like George's when he was a kid. LizzyNY wrote: I think the clothes give it away. The twin Amal is carrying is in jeans and a t-shirt. Very butch. The twin in George's arms (barely - why can't he ever put down his phone?!) is in pouffy pants and sweater. Not really a great look for a boy. - And the hair! 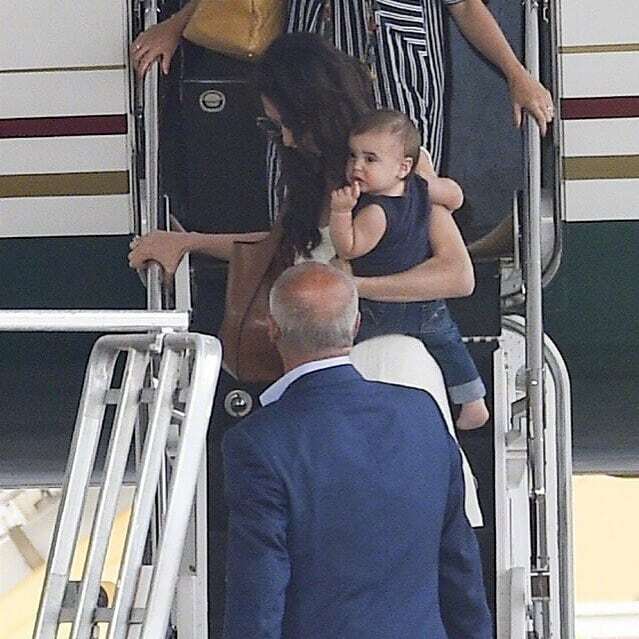 That side part on Amal's little guy is just like George's when he was a kid. Hairyhound - Took another look and whatever he's holding in his hand I don't think it's passports - at least not US passports. I don't think the UK passports look like that either. 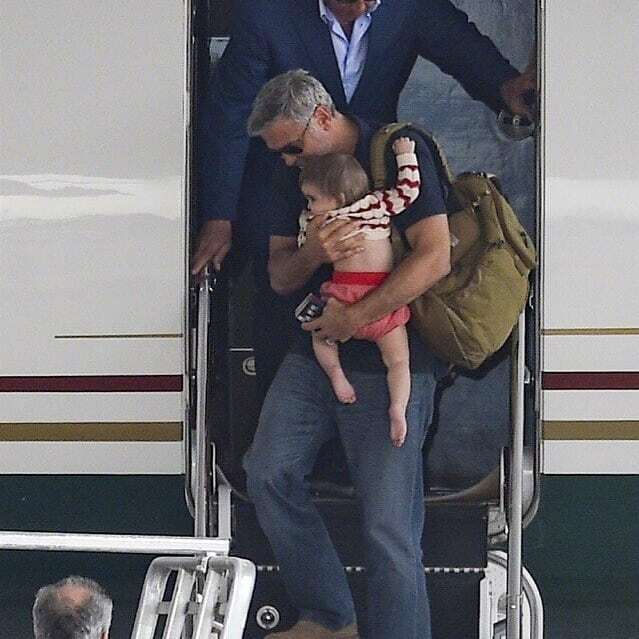 Of course Amal is carrying Alex as he looks much bigger...Ella is the cutest thing I've ever seen! Sevens!!! Where have you been?? Hi, Sevens! Welcome back! I wondered why we haven't heard from you. Hope all is well. When I saw the thing in his hands I though flash cards maybe something for the kids to play with. Ella (George definitely has Ella, they're progressive but not "dress-our-kids-as opposite-genders progressive") is sliding down because he's trying to carry her and his bag on the same arm. She can't get her little leg around his waist with the bag there. I also believe that's Ella because of the Vogue reporter's comment that he felt Ella was judging him and he was "coming up wanting". That baby looks like service on this flight was not up to snuff and corporate will be receiving a STRONGLY worded letter. I love that the kids always (well, both times we've seen them) are dressed comfortably and like anyone else's kids. I'm sure those clothes didn't come off the rack at Target, but they look like clothes you'd see on any baby at the park, rather than like they're meant to be dress up dolls. Based on these pics and the other ones, I agree that Ella is the most energetic (for lack of a better term) of the two. George kinda said the same thing, when he said that Alexander only wants to eat. BTW, I like their names every day more, they're so elegant.